Acura needs this $54 million investment to pay off. 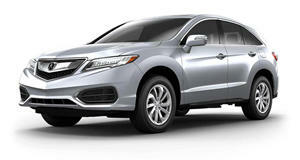 The Acura RDX has been around since 2007 and it’s since become a vital crossover for the luxury brand. The and production is now underway. Acura made the official announcement that yesterday, May 15, the first 2019 RDXs began rolling off the assembly line in East Liberty, Ohio. \ The new RDX, according to Acura, is a “clean-sheet, top-to-bottom redesign” of its hot-selling five-passenger compact luxury crossover. Its success is so important to the brand, in fact, that Acura invested some $54 million in new technologies and production techniques at the Ohio facility. The new RDX, the first generation that was entirely designed and developed in America, is the first new model that utilizes Acura’s new precision crafted performance build philosophy. For example, there’s a new roller hemming process for the vehicle’s extra-wide panoramic moonroof, and the use of high-performance structural adhesives for enhanced body rigidity. There’s even a new multilayer paint system for premium color options. It’s also important to note the 2019 RDX is built on an exclusive platform, whose wheelbase is 2.6 inches longer than that of its immediate predecessor. Overall length is increased by 2.5 inches, thus allowing for additional passenger and cargo space. Because of this minor growth spurt, Acura decided to drop the previous V6 engine with the same direct-injected and turbocharged 2.0-liter VTEC four-cylinder we’ve come to see in other new Hondas. Total output is rated at 272 hp and 280 lb-ft of torque. The old V6 offered 279 hp and 252 lb-ft. Power goes to either the front or all four wheels (via the excellent and latest Super-Handling All-Wheel Drive system) through a 10-speed automatic transmission. Since 2006, the Acura RDX has been the top-selling compact luxury crossover in the US, and the automaker has no intention of allowing that to change.